In Venice both rich and poor hunted birds for sport and sustenance. 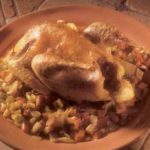 This recipe for guinea hen with black pepper sauce suggests the Renaissance, when spice played an important role in flavoring, often counterbalanced with a touch of sweetness. “Game birds are lean,” Francesco says, “Which is why we use the bacon.” Baby pheasant can be substituted. On a pan sauté the peppercorn in hot olive oil at medium heat. Add the red wine at high heat, until it dries. Add the cream and stir until creamy. Add salt. Place the rosemary and garlic in the cavity of the guinea hen. Rub the bird inside and out with the herbed salt, then truss it. Heat the olive oil in a deep casserole large enough to hold the bird. Sear the bird in the oil on top of the stove to brown in lightly on all sides. Remove the bird from the pan and scatter the slab bacon, carrot, celery, and onion in the casserole. Preheat the oven to 425°F (220°C). Place the bird on the vegetables in the casserole. Sprinkle the wine and stock around it and scatter 3 teaspoons of the peppercorns casserole. Cover the casserole and place in the oven. 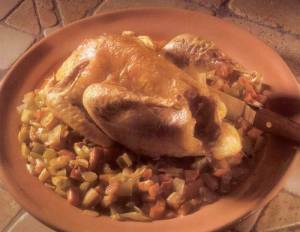 Remove the guinea hen from the casserole and strain the pan juices into a saucepan. Heat the sauce and add the remaining whole peppercorns. Season to taste with salt. You should have about 1½ cups (375 ml) of sauce. Remove the trussing from the guinea hen and quarter it. Arrange it on a platter with the vegetables and serve with the sauce alongside.